Credit: X-ray: NASA/CXC/U.Illinois/R.Williams & Y.-H.Chu; Optical: NOAO/CTIO/U.Illinois/R.Williams & MCELS coll. This composite X-ray (red and green)/optical (blue) image reveals a cat-shaped image produced by the remnants of two exploded stars in the Large Magellanic Cloud galaxy. Although the shells of hot gas appear to be colliding, this may be an illusion. Chandra X-ray spectra show that the hot gas shell on the upper left contains considerably more iron than the one on the lower right. The high abundance of iron implies that this supernova remnant is the product of a Type Ia supernova triggered by the infall of matter from a companion star onto a white dwarf star. In contrast, the much lower abundance of iron in the lower supernova remnant indicates that it was a Type II supernova produced by the explosion of a young, massive star. It takes billions of years to form a white dwarf star, whereas a massive young star will explode in a few million years. The disparity of ages in the progenitor stars means that it is very unlikely that they exploded very close to each other. The apparent proximity of the remnants is probably the result of a chance alignment. 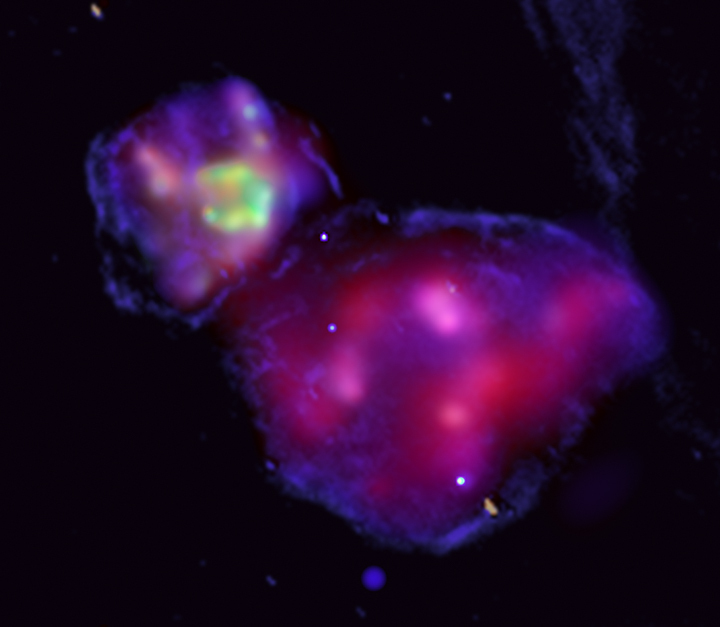 Credit X-ray: NASA/CXC/U.Illinois/R.Williams & Y.-H.Chu; Optical: NOAO/CTIO/U.Illinois/R.Williams & MCELS coll. Coordinates (J2000) RA 05h 47m 15.00s | Dec -69º 42' 25.00"